The polls of the Drammies 2008 are closed but Kevin Erskine has posted the picks of yours truly at The Scotch Blog in the run-up to the official announcement of the winners next week. Hope you all voted and many many thanks if you happened to vote for Dr. Whisky as best new product(non-whisky... though I am certainly full of the stuff). Here is another whisky that my friend Tommi brought over for Dr. Whisky in little sample bottles from his collection at home in Finland (had another yesterday). Thanks, buddy. 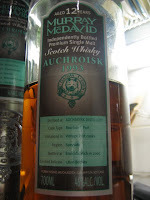 Murray McDavid is an independent bottling company that is now tied to Bruichladdich distillery on Islay. For over a hundred years independent bottlers were the only people bottling whisky from single distilleries as most distillers output went nearly exculsively to blends. It seems hard to believe today but proprietary releases of 'single malt whisky' is actually a pretty recent 'invention', popularised by Glenfiddich who marketed their single malt in1963. By no means was this a new concept, but it had never been done on a large scale. Glenfiddich now outsells its nearest competitor by double. By double? That sentence sounds wrong. Whatever. You can edit it in your mind. I have to get to work. -the site was chosen because of the water source "Dorie's Well"
-the first official bottling was in 1986 as a part of the Singleton of ______(distillery name here) range, a series that has been reintroduced in recent years. -Auchroisk has been a part of the Flora & Fauna range since 2001. Roboust nose of clotted cream and raspberry jam, milk chocolate. Rice vinegar. Some spice like pine, fennel, or the white bulbs of green/spring onions. Chinese hot and sour soup. Butterscotch with ginger and hot peppers. Brioche and a thin layer of marmite. White pepper. Creme brullée. A very winey finish with some vegetal notes as well. A rich nose that has few comparisons at this price point. While many criticise finishing, this extra time in port pipes has added a wonderful depth of flavour that adds incredible value to this drop. Nice work.